I’ve finally realized the hard way that I am not superwoman. Not even close. I’ve had some health issues (nothing serious just colds I can’t shake) so I finally decided to sit out a term for Rob. I hate getting out of the grove but in the fall I only made every other class so it seemed best to just take a break and come back in the spring. I love this drawing. 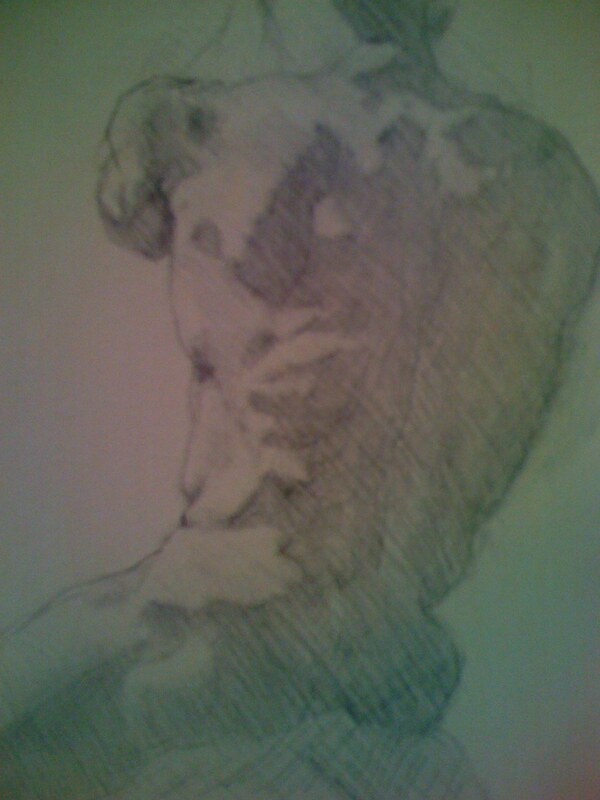 I drew it during an upper torso anatomy class with Rob and its one of my favorites. I’m glad you are back – I missed looking at your work, your comments and the information about various art events. This is definitely a good torso study – one observation, the left hip seems too abbreviated – maybe he, the model was very thin and perhaps I’m too picky. All in all a tremendous study that anyone would be happy to claim as the fruit of their labors. The angle looks off because of the model’s pose as well as were I sat in relation to him. This particular model has about 2% or so body fat. When he flexes you can actually see the grain of the muscles under his skin.